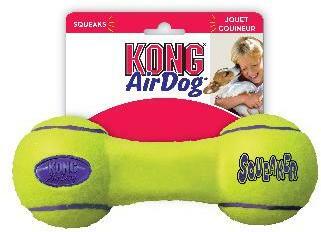 The KONG air dog toys are made with a special nonabrasive tennis ball fabric will not wear down a dog's teeth. All squeaker units are recessed in rubber and covered with tennis ball fabric for safety. Give them a squeak. Details: AIR KONG KONG Fetch Toys A new spin on an old favourite! Air Kong toys are 100% pure tennis ball in fun shapes. Air Kongs bounce erratically on land and float high in the water.